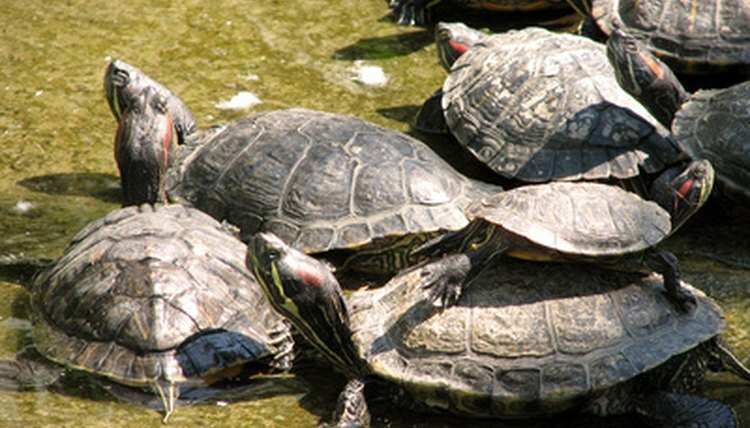 Turtles are a surprisingly diverse group of animals, with 55 species occurring naturally in the United States. Where a turtle lives in the wild depends on the species, as different species have different habitat requirements. Several species, such as the common snapper and softshell turtles, spend most of their time completely submerged. These types usually inhabit shallow ponds, lakes and slow-moving streams or rivers. The most commonly seen aquatic turtles are those that climb onto rocks, branches and logs above the water to bask in the sun. These include painted turtles, map turtles and sliders. These species frequent ponds, lakes and rivers with many available basking sites. A few species of turtle rarely venture into water, but instead inhabit terrestrial habitats. Box turtles are the most well-known land turtles. In North America, the Eastern Box Turtle frequents woodland habitats, while the Ornate Box Turtle prefers the open grasslands and prairies of the west.